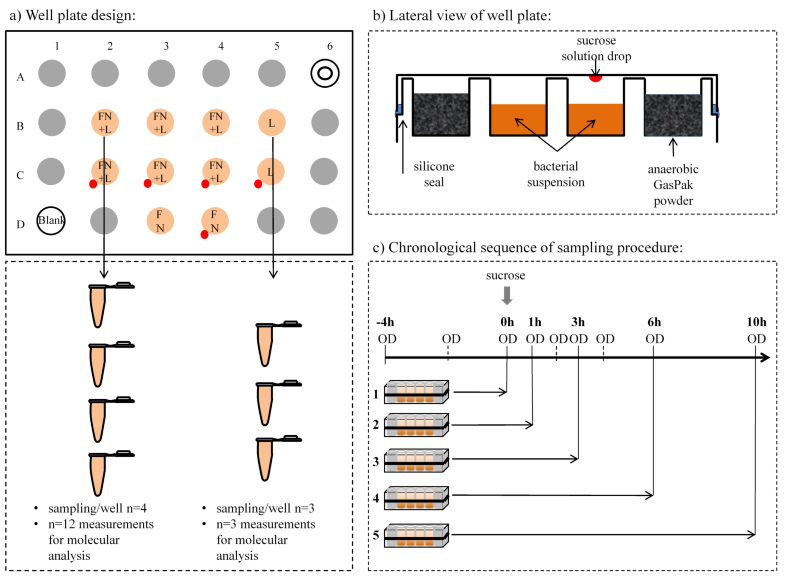 The present study aims at correlating the relative bacterial activity with the H+ concentration and the ldh expression of caries-associated bacteria in co-cultures. Well plates were prepared with BHI medium and cultures of Lactobacillus paracasei and Fusobacterium nucleatum. 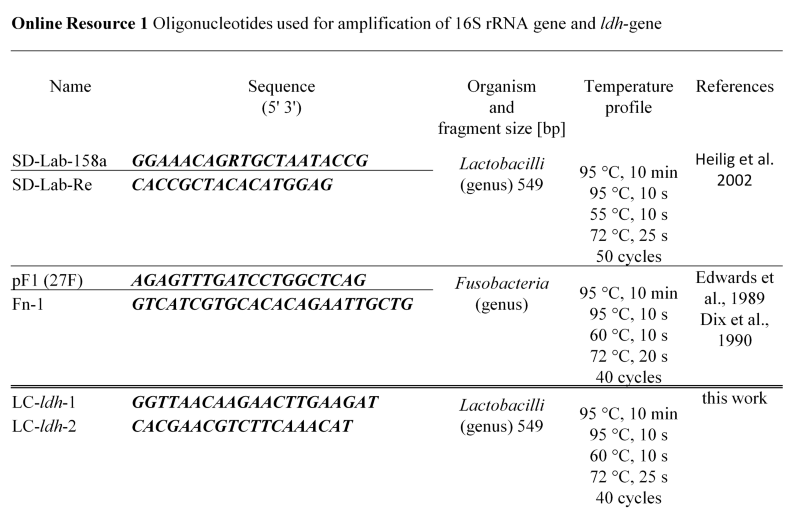 Bacterial growth at 37 °C was measured using a microplate-photometer before and after adding sucrose to the samples. Samples of co-cultures (n = 12) and single-species cultures (n = 3) were taken and pH was assessed. Real-time quantitative PCRs were applied targeting the 16S-gene, the 16S-rRNA, the ldh-gene, and the ldh-mRNA. For L. paracasei with sucrose, an increase in relative bacterial activity (62.8% ± 23.5% [mean, SE]) was observed, while F. nucleatum showed a clear decrease in relative bacterial activity (− 35.0% ± 9.6%). Simultaneously, the H+ concentration increased (1.15E-05 mol*l-1 ± 4.61E-07 mol*l-1). Consequently, a significant positive correlation was found between L. paracasei’s relative bacterial activity and H+ concentration (Spearman rank correlation, r = 0.638; p = 0.002), while F. nucleatum exhibited a negative correlation (r = − 0.741; p ≤ 0.001). Furthermore L. paracasei with sucrose showed a moderate, but significant positive correlation between relative bacterial activity and ldh-expression (r = 0.307; p = 0.024). The relative bacterial activity after sucrose pulse showed a significant correlation not only to the acid production (H+ concentration) but also to ldh expression of L. paracasei. However, further research is required to confirm these findings in a mature biofilm in vivo. Marcella Esteves-Oliveira and Karsten Henne contributed equally to this work. The online version of this article ( https://doi.org/10.1007/s00784-018-2547-2) contains supplementary material, which is available to authorized users. The technical assistance of Beate Melzer-Krick and Laura Katharina Wendt is greatly acknowledged. The funding of this research work was done with the internal resources of the Department of Operative Dentistry, Periodontology and Preventive Dentistry of RWTH Aachen University and the Division of Oral Microbiology and Immunology, Department of Operative Dentistry, Periodontology, and Preventive Dentistry of RWTH Aachen University. 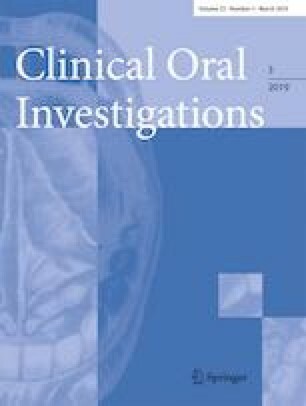 This article does not contain any studies with human participants or animals performed by any authors.